Two towering peaks of Russian music – a world-favourite violin concerto and one of the greatest 20th century symphonies – are being brought together for St Albans Symphony Orchestra’s concert on Saturday 11 March (7.30pm, St Saviour’s Church, Sandpit Lane, St Albans AL1 4DF). Tchaikovsky’s Violin Concerto has delighted audiences for more than a century with its unsurpassed flow of romantic melody and drama. So it is hard to believe that it was given a cool critical reception after its delayed premiere in 1881, while potential soloists appeared intimidated by its virtuoso demands. No such qualms can be expected from David le Page, SASO’s chosen soloist, who has not only gained critical acclaim for his technical ability, but also his capacity for applying a fresh perspective to familiar masterpieces. 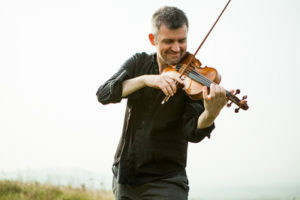 Born in Guernsey, David started playing the violin at the age of seven and attended the Yehudi Menhuin School before becoming prize winner in the BBC Young Musician of the Year competition. In addition to working with a wide range of orchestras and ensembles, he is a composer in his own right and has recorded and released three collections of his own music. A forthcoming solo album ‘Metamorphosis’ includes radical reworking of music ranging from Beethoven and Bach to the ‘post-punk’ band, Joy Division. For the Tchaikovsky Concerto, David will be playing a violin by Jean-Baptiste Villaume – made in France just four years before the work was composed. Serge Prokofiev had the misfortune to die in the former Soviet Union on the same 1953 day as Joseph Stalin. Yet this does little to explain why his six symphonies have been relatively neglected while his ballet Romeo and Juliet and musical children’s story Peter and the Wolf remain popular. His Symphony No 5 was written in 1944 as the Red Army turned the tide against Nazi invasion and stands out for its epic scale and emotional range. Grief and joy are never far apart. The composer described it as “a symphony of the greatness of the human spirit”. Its sound-world is sometimes close to his ballets, but closer at others to the pulsating scores he wrote for films such as Alexander Nevsky and Ivan the Terrible. The symphony is also one of the more technically challenging works that SASO, under conductor Tom Hammond, has attempted. Prokofiev in lighter vein, provides the starting work for the concert, with excerpts from the orchestral suite taken from his much earlier, satirical opera Love for Three Oranges. The opening march is well-known through radio, television and the concert hall, even though the opera is seldom staged.